"The Moat House stood not far from the rough forest road. Externally, it was a compact rectangle of red stone, flanked at each corner by a round tower, pierced for archery and battlemented at the top. Within, it enclosed a narrow court. The moat was perhaps twelve feet wide, crossed by a single drawbridge. It was supplied with water by a trench, leading to a forest pool and commanded, through its whole length, from the battlements of the two southern towers. Except that one or two tall and thick trees had been suffered to remain within half a bowshot of the walls, the house was in a good posture for defence." Robert Louis Stevenson. "Black Arrow". It is rather strange: they are constantly the most demanded tourist attraction. How many castles have you visited in your life? A hundreed - hardly. Rather, a dozen, maybe more. Were there particularly outstanding among them? Probably yes. But memory keeps at most one abstract image or picture from "Lord of the Rings" for example. Nevertheless, if only I have an opportunity to visit one more I will go without any hesitate. Built approximately in XI century. Was damaged and restored many times. The last restoration, returning the original appearance, completed in 1937. Castelmonte Sanctuary is the most ancient in Friuli and one of the first christian in the world. Dated approximately V century just after Efeso's Concilium in 431 There is one more smaller castle in Cividale - Castello Canussio. Have no chance to take photo - sorry. XIII century. Once served as a port of Verona Flotilla. Scaliger (it. della Scala) — noble family were Lords of Verona since 1262 till1387 - Verona is right nearby. There was a resort here even during the time of the Roman Republic and so far. Hot springs, thermal hotels, including two five-star. One of the most beautiful places at Garda. Soccer field, apple trees behind the goal and fortification. This is also at Garda lake. The castle belongs to the XIV century. Also was a part of the esteemed family Scaligero assets. It is possible to spend a wedding ceremony there - write me if anybody tries. By the way, there is a place absolutely remarkable in all respects - Bardolino. I believe they have really substantial reserve of it there. Anyway welcome.﻿ Remember that right bottiglia contains not less than ten liters of divine drink. The residence of the Dukes of Savoy. The first mention dates back to 1160 year. The boldest version referred to the IX century. History is standard: castle - prison - museum. Located on Geneve Lake (Switzerland, Vaud). In the vicinity of Montreux. Convenient to visit also because of position right by the road. There is dairy as well but it's down the hill and quite up to date even robotic. I would not call it must-see destination visit. Although I love Gruyere cheese. And now our love has gained new dimensions and angles. Canton is called Vaud. Chablais - Name of a larger region look at the Wikipedia link. Not to be confused with Chablis in Burgundy. You'll fail to choose right drinks without a bit geography. Built in the XII century by the Dukes of Savoy. Since 1475 belongs to the government of Bern. 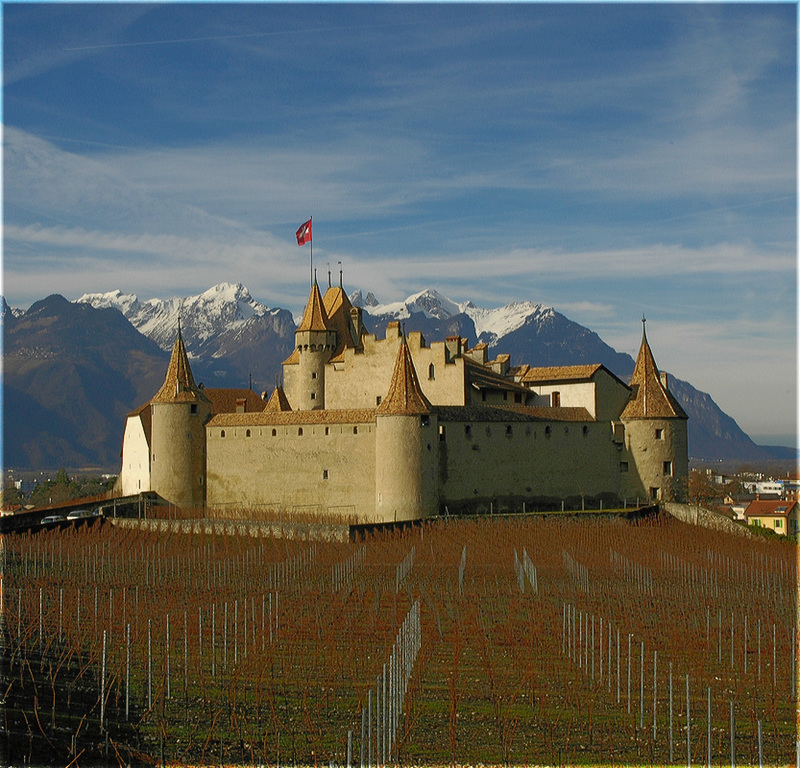 A museum of wine and viticulture. Restaurant... Delicious... Mmm very delicious... Oh, and wine… Noway without it. Obviously besides cosmic nature there is some romantic symbolism sending accurately to the most happy and easygoing years. They seemed to have passed, but hiding somewhere nearby. There are places and circumstances where realities fit together. And then it becomes so cozy, as if under grandma's blanket so you want to get under it quickly with legs and read some old adventure book. They were built to protect the population today they wouldn't help to protect anymore ! Great shots of the castles. I remember seeing castles when I was growing up in Europe. But they simply don't exist where I live now.